Christmas Eve is my favorite time to eat!! Being Italian we celebrate this night with the Feast of 7 Fishes. Now as far as I know it is not important which fishes you eat, just as long as there are 7. I think my favorite thing to eat, and it seems to be the most common dish among the Italians that I have ever talked to about this, is Baccala. Baccala is salted cod. Almost all cultures that originate by the ocean have a version of this fish and a name for it too. It's salty and fishy and people either love it or hate it. I LOVE it. In my family we serve it in a cold salad with hot (spicy) cherry peppers. Mmmmmmmm!!! Anyway.... This entry is not about Baccala. 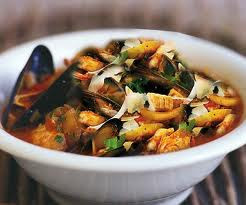 It's about Zuppa di Pesce.